An unidentified CMHC photographer captures the view from an upper balcony (or perhaps the roof) of the Westbury Hotel in Toronto on June 19, 1969. Image: CMHC, 1969-544. 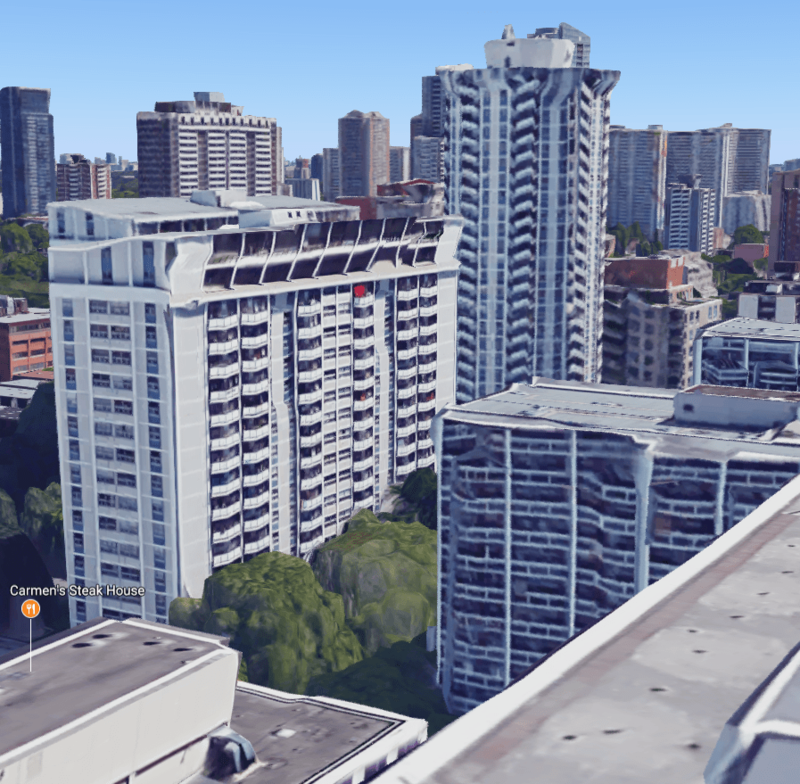 Of the things I’ve hoped to see more often appear on the CMHC’s FTP site since it began being indexed by Google a few years back, I must say that it is photographs that I’ve wanted to see more of. Although I love the slow (but consistent) digitization of print materials, there is something to be said for high-quality scans of colour slides from the Corporation’s archives that really make so much come alive. A small handful of images from Toronto taken in 1969 and 1971 has always been interesting to me. On June 19, 1969, an unidentified photographer for the CMHC spent time on an upper balcony of the Peter Dickinson-designed Westbury Hotel (1957) to take pictures of an area of the city that had been the site of much construction activity. 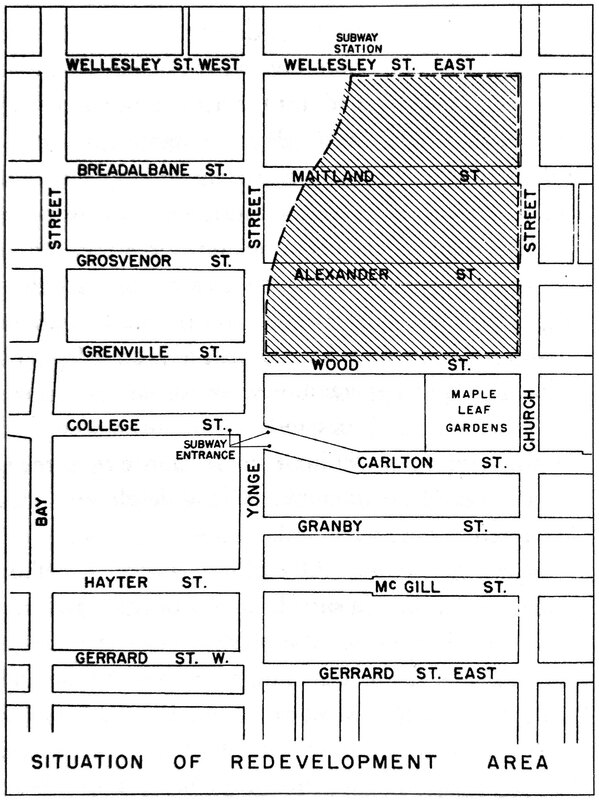 The Wood-Wellesley Improvement Area was Toronto’s first specifically-defined “redevelopment area,” and was declared so in November 1952. While progress was at first quite slow, things had really begun to pick up during the 1960s.1Richard White, Planning Toronto: The Planners, The Plans, Their Legacies, 1940-1980 (Vancouver: University of British Columbia Press, 2016): 57, 153. The Wood-Wellesley Improvement Area. Source: Richard White / Toronto Public Library, CPTB, “Wood-Wellesley Redevelopment Area: Third Report,” April 1956. Of course, it’s not just Wood-Wellesley that is visible in the CMHC’s photograph: the beginnings of the St. James Town urban renewal project, which was just getting established in earnest, is visible in the distance.2For more about St. James Town, see Chris Bateman, “St. James Town and the Messy Politics of Urban Renewal,” (BlogTO, April 26, 2014); Jamie Bradburn, “Toronto Feature: St. James Town,” (The Canadian Encyclopedia, July 2, 2015). I will have more on that later, as the folder contains a number of striking shots of the project. 1. City Park Apartments; 2. Village Green Apartments, 3. Where I think the CMHC photographer was standing. Image: City of Toronto Archives, Series 12, 1969, Item 48. Progress on St. James Town in 1969. Image: City of Toronto Archives, Series 12, 1969, Item 48. Looking outward. I’m not a professional with these, but it seems fine. Image: City of Toronto Archives, Series 12, 1969, Item 48. 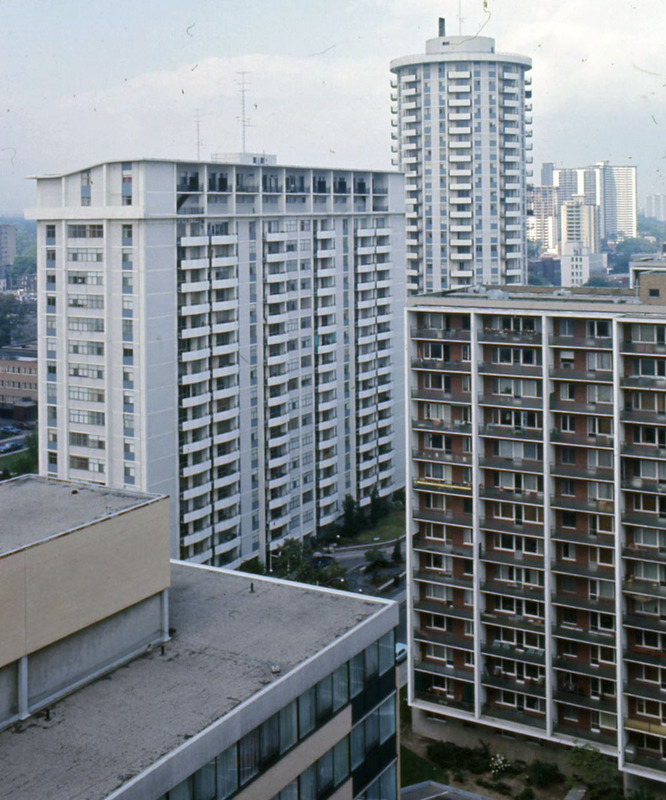 In the foreground of the image are the City Park apartments (1957), designed by architect Peter Caspari and popularly understood to be Toronto’s first modern apartment complex, and the Village Green Apartments (1965), a distinctive John H. Daniels design that was a collaboration between the Cadillac Development Corporation and the Greenwin Construction Company. An advertisement for Village Green. Source: Toronto Star, January 15, 1965, 33. Advertisement. Source: Toronto Star, February 16, 1968, 14. A view from the ground, April 27, 1981. Image: Harvey R. Naylor / City of Toronto Archives, Fonts 1526, File 6, Item 27. One of the things I often try with such pictures is to reproduce them as best I can with Google Maps. 1. ↥ Richard White, Planning Toronto: The Planners, The Plans, Their Legacies, 1940-1980 (Vancouver: University of British Columbia Press, 2016): 57, 153. 2. ↥ For more about St. James Town, see Chris Bateman, “St. James Town and the Messy Politics of Urban Renewal,” (BlogTO, April 26, 2014); Jamie Bradburn, “Toronto Feature: St. James Town,” (The Canadian Encyclopedia, July 2, 2015).